The city of Avalon is seeking solutions while the community is dealing appropriately. AVALON ― Catalina is in an ongoing drought as is the rest of California. Strict water restrictions are in effect in Avalon and the community has reportedly responded remarkably. The city continues to search for effective ways to address the island’s water shortage. At a City Council meeting last month, a project manager from Southern California Edison (SCE) brought Avalon’s elected officials and staff up-to-date on the upcoming plans to help address the drought. There are three new grant opportunities being pursued and additional projects in various stages. Pump tests will be conducted on an existing well at Middle Ranch to determine whether a new deep water well is feasible. “Catalina’s drinking water resources have been deleted to near all-time historic low levels. All Catalina residents and businesses are now required to cut back on water use even more to preserve our water resources,” as stated on SCE’s website. 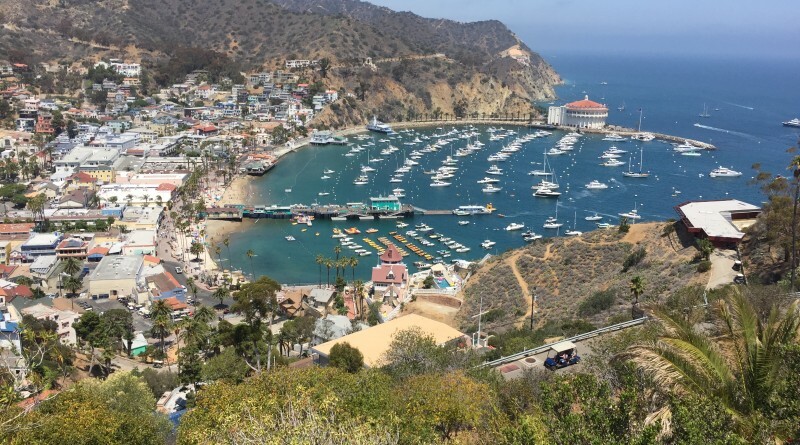 There are approximately 4,000 residents in Catalina year-round and more than 700,000 island visitors annually, according to SCE. The majority of residents are in Avalon (population: 3,799). The city is currently in Stage 3 of its Mandatory Water Conservation program. Stage 1 of Mandatory Water Conservation was implemented in Catalina more than two years ago due to the drought. This phase restricted residents from washing cars, driveways, piers and streets. Restaurants were not allowed to serve water unless asked. Stage 2 went into effect in August as a result of the Middle Ranch Reservoir water level falling below 300 acre. On Sept. 6, Mandatory Water Conservation progressed to Stage 3 when water level fell below 200 acre. This required 40 percent of water rationing for businesses and residences in Avalon. The first customer bills SCE received under Stage 3 shows water usage by the community has been reduced by nearly 59 percent, which is an 18 percent improvement of water rationing since Stage 3 was implemented even with a visitor count increase of nearly 30 percent. As of Nov. 10, Middle Ranch Reservoir water level was at 123 acre-feet, about 12 percent of its capacity. Stage 4 mandatory water rationing will only be implemented if the water base amount of the reservoir reaches 50 feet. With fresh water levels dropping in the Middle Ranch Reservoir, a second desalination plant was put in place to provide additional drinking water for Avalon in 2016. The city of Avalon owns the saltwater system. Southern California Edison (SCE) owns the filtered water systems and provides drinkable water to Avalon. The freshwater systems that SCE oversees for Catalina include wells, storage, treatment, distribution and two desalination plants. “Avalon has sufficient water that can be produced by two existing desalinization plants to not be in a drought. The rules governing how droughts are determined must be changed,” Avalon City Manager David Jinkens said. With Mandatory Water Conservation, restaurants are currently required to charge their patrons for a glass of drinking water. “Charging people 50 cents for water, people weren’t fazed by it. We are not out there to make a dime on it,” said Bray, owner of Steve’s Steakhouse located on the main street in Avalon overlooking the bay. Those not adhering to the restrictions of water usage will first receive a written warning. Those that continue to violate water use restrictions will be fined. Bray is more than willing to pay the fine if his restaurant exceeds the designated water allotment. He wants to make sure that his customers are taken care of, but he also has taken measures to conserve as much water as possible. Some of the steps that he has enforced in his restaurant are to ensure the dishwasher is filled to capacity before running as well as turning down all pressures from bar, restroom and kitchen faucets. “People from the mainland get a little upset [about paying 50 cents for water],” interjected Margaret Bray, owner of Maggie’s Blue Rose. As more people have become aware of the dire drought situation, however, this has become less of an issue. “Avalon has the capacity with its desalinization plants to ensure a sustainable water supply for Avalon and our tourists if the steps we are seeking are taken,” Jinkens stated. The City Council has requested and is still waiting on SCE’s approval to provide water rationing waivers to businesses and hotels. The city recognizes the community has done a great job with water conservation efforts. Because of this, the city wants to find a way to give back to the community to relieve some of the stress on Avalon residents. City council members are reaching out to companies such as Nestle, Aquafina and Fiji Water to see if they are willing to donate water. Avalon Freight Service said they would help out if they can get a waiver from the public utilities commission. The freight cost to ship water to the island is one of the company’s biggest barriers. There is currently a two-year supply of water thanks to the conservation efforts of the entire community, according to Lawrence. The Brays mentioned their clientele consists mostly of boaters and yacht club members. They rely on them for business. The Brays heard boaters might not be visiting Avalon as frequently as before since they do not want to contribute to an already diminished water supply. Boaters, however, have their own water the Brays said, adding they know how to and participate in conserving water. One City Council member pointed out Avalon is still able to produce enough water and visitors are welcome. The city and SCE expressed appreciation for the community’s efforts and are looking for more ways to help.